Access to this notable bog provides views from boardwalks floating on a mat of tundra like vegetation. An entrance sign and a kiosk with descriptions of the flora and fauna that might be seen from the trail flank the walkway. A guide is available here and at the kiosk that include a map and describe a self-guided nature trail. 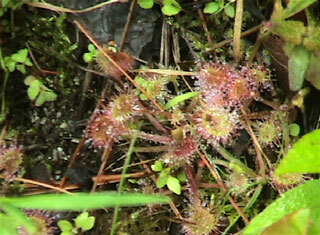 There are many interesting flowers in the bog and a link is provided to a monthly guide to bog flowers. 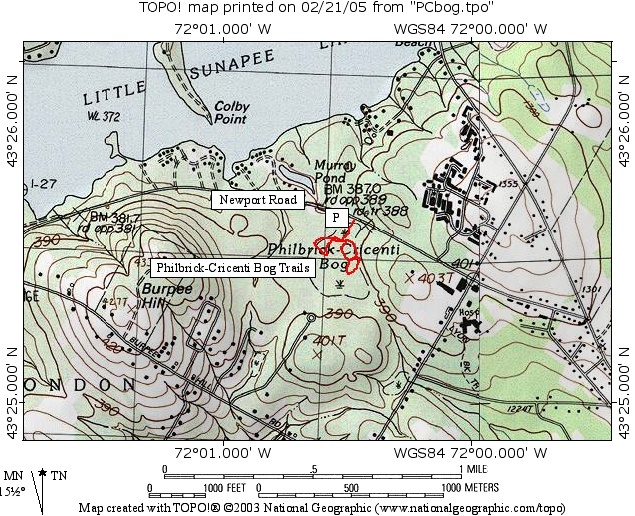 The Philbrick-Cricenti Bog Trail system starts at the parking area (P) on the south side of Newport Road opposite the entrance to the Great Pines development and .3 miles west of the Hannaford Supermarket. The trail system has boardwalks that span wet areas in the bog. Care should be taken while traversing the boardwalks. 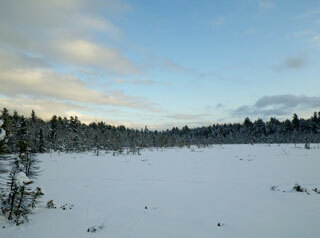 Three loop trails comprise the parts of the system that venture onto the bog. PLEASE STAY ON THE BOARDWALK WHEN WALKING THROUGH THE BOG. The total length of the three loops plus the access trail (two way) is less than one mile. 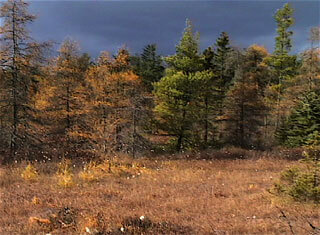 In 1995, Philbrick-Cricenti Bog received the Homer Lucas Landscape Award from the New England Wild Flower Society. 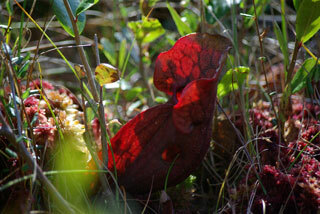 The bog was judged to be "an outstanding public garden displaying native plants. The bog offers visitors a beautiful and tranquil retreat as well as a fascinating opportunity to learn about a distinctive natural habitat."